The cloud is more efficient and cost-effective for managing big data compared to traditional on-premises data centers. Whether you are evaluating cloud platforms or already running big data workloads in the cloud, there are three pillars for success with big data. 1. Embrace The Cloud. Take advantage of the cost efficiencies with the as-a-service model; along with scalability and flexibility of cloud computing. 2. Single Platform For All Users. Ensure all data users are on a single platform working on the same view of the data and void silos and project delays. 3. Boost Productivity with Self-Service. Ensure the data team is not the bottleneck by enabling users with self-serve access with appropriate controls, policies, and governance. 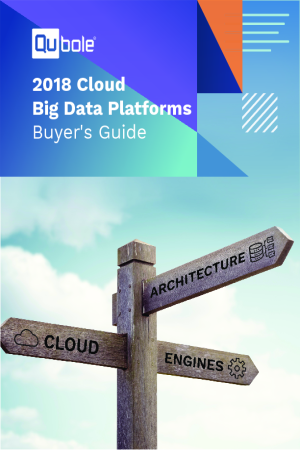 Download our Cloud Big Data Platforms Buyer's Guide for more tips on how to make the move to the cloud.